This is one awesome gift with purchase. 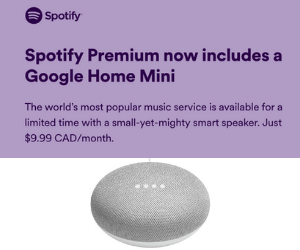 Sign up for Spotify Premium at only $9.99/month and get a FREE Google Home Mini worth $79! You can choose between Charcoal or Chalk colours and the standard shipping is free. The offer is valid until May 9th, 2019 or while supplies last. Be sure to click the "Reserve Yours Now" button on the confirm page. You will not automatically be given the Home Mini without claiming. You'll be sent a confirmation email to your inbox to claim it. Be sure to check your Spam folder as well.